A while ago, not too long, I showed you how to start developing your Word Add-in from scratch using nothing but command line tools. Check my blog archives for the last couple of weeks if you missed that. 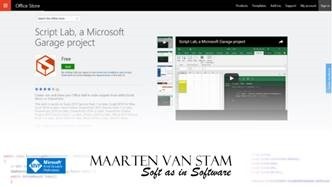 Today we are looking at the same process but now using Visual Studio. 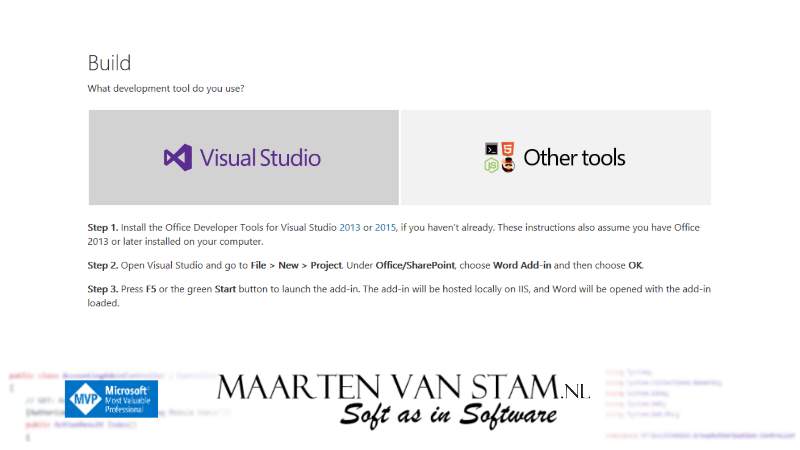 It is already hopelessly outdated, mentioning to install the Office Developer Tools for Visual Studio 2013 or 2015 while Visual Studio 2017 has been around for quite some time. 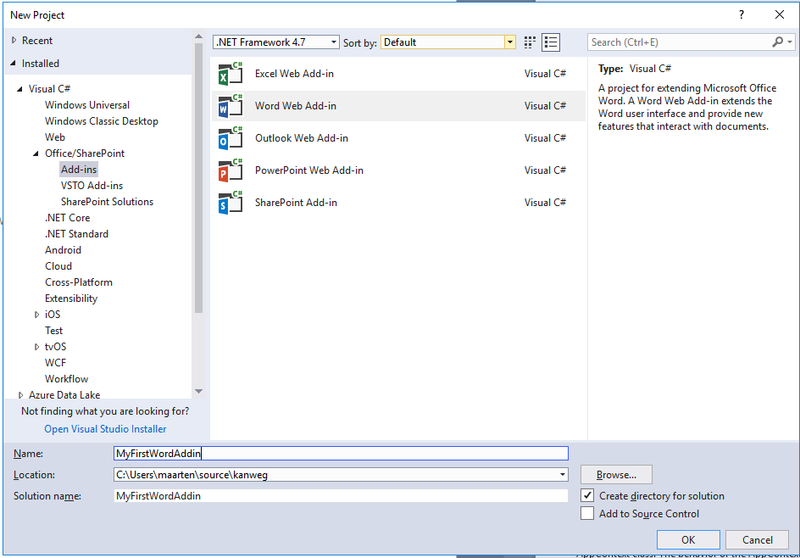 The process however is still unchanged for the most part, I will show it in practice in a later blog, but if you follow the three steps you are basically already there, where without Visual Studio and just using the command line tools we had to go through a large series of requirements and certificate fixes to make that work. Michael and I go back quite some time already, I met Michael years ago, I thinks around 2012, when we were all still developing VSTO Add-ins. Michael always was very helpful and supporting when I needed information or struggled with issues. 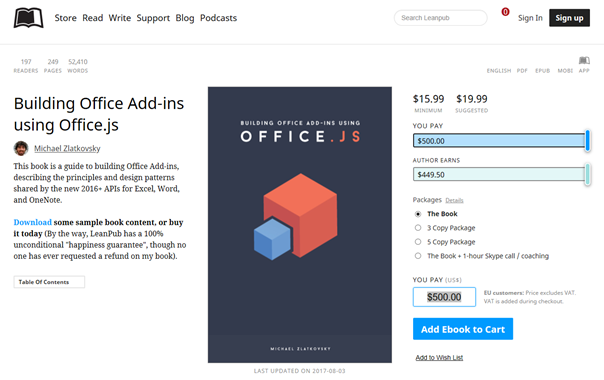 Now get on over to LeanPub site and buy the book! Did I mention already where to get it? 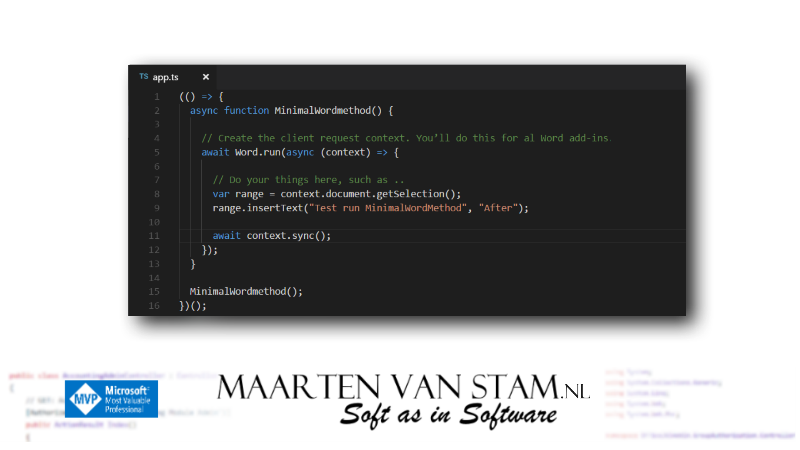 // Create the client request context. You’ll do this for al Word add-ins. 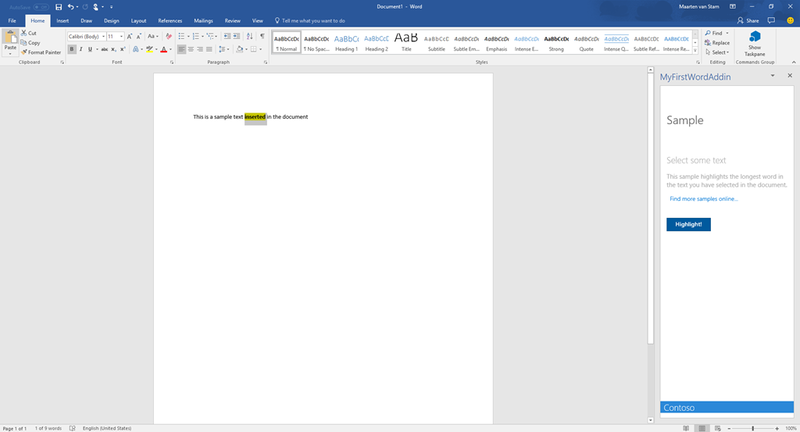 // Do your things here, such as ..
Michael explains it in his documentation but is written for Excel, however as you can read on the same page it is fully compliant with Word.run. You can think of the Excel.run as a boiler-plate preamble; it is the batch function that is the star of the show, but it needs a request context in order to start off the chain of OM calls. The Excel.run call is simply a means to that end, as it creates a new request context that it passes into the batch function. 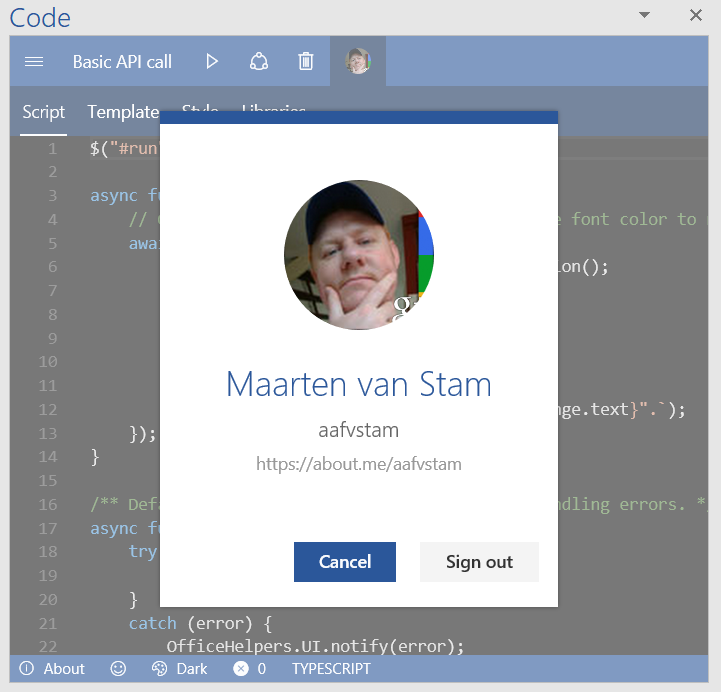 Go back to the Yeoman project from yesterdays post, open the project folder and open the file app.ts in the src source folder. Replace all the code from this file as seen in the top snippet with the code from the second, new snippet above. Save it and start your Add-in ‘server’ by running npm start in the root of your project. Without creating your own context the Word.run function created its own context and the code still works. As you can see this helps you to take some effort out of your hand. So far it has been fairly complex, installing lots of components and doing all sorts of things before you get things to work. But what do you need for code to do just the minimal thing in a Word Add-in? With this context you can do things the things you’d like to do. I want to find out where this happened in the Yeoman boilerplate. As far as I can tell the documentation is not all too clear about this. 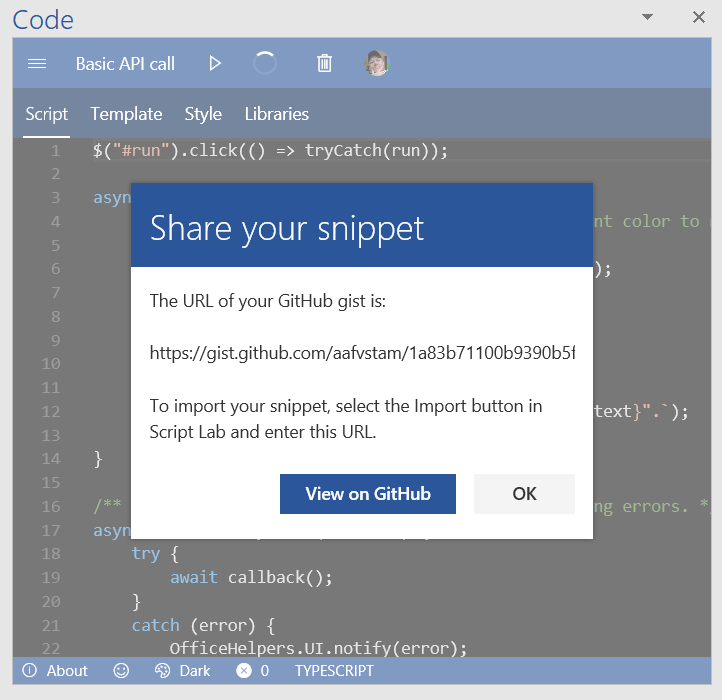 One of the nice things in Script Lab is that you can connect it to GitHub allowing you to share your code snippets or import code snippets from other people. If you opened the Script Lab Task Pane you will notice this little person icon with an even smaller plus sign. Gists are a great way to share your work. 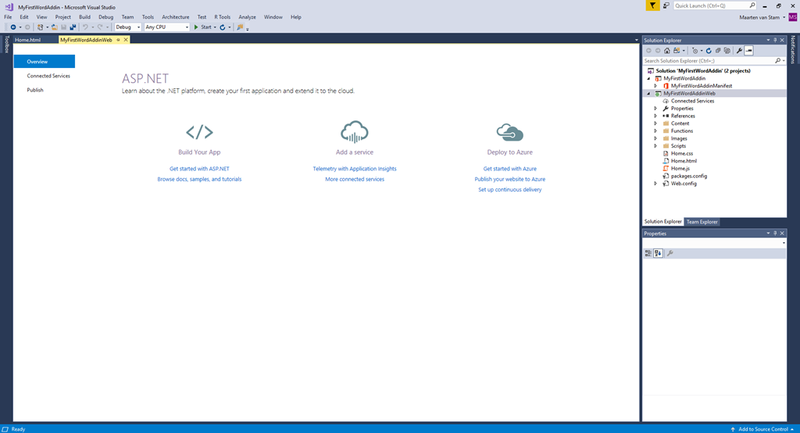 You can share single files, parts of files, or full applications. You can access gists at https://gist.github.com. A great option to either store your scripts that you created by Script Lab for your own use but even better: to share the code with others. Get feedback, or simply make someone happy by providing the code to the community! Clicking the button will ask you for your permission on your GitHub account. 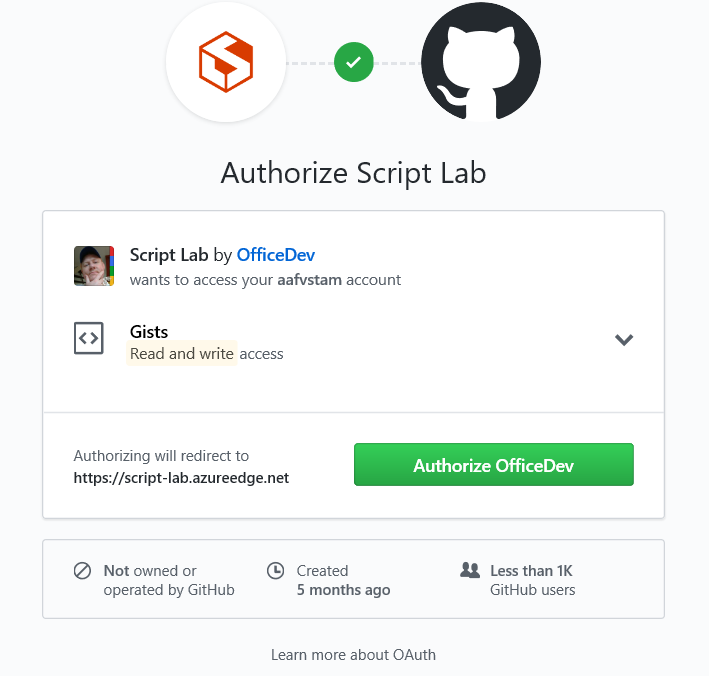 The permissions are not all that shocking, you just give permission to create, edit and get Gists from your account to be able to show it in Script Lab. From there you can also revoke the permissions if you think they shouldn’t need the access anymore. In general, it is a good idea to go in there every now and then to evaluate who can access your code and are they still in the position where they need access. Over time the number of permissions can grow while maybe you don’t use many of the services anymore. If so, time to clean up while you are at it! Clicking the little profile icon will allow you to see the attached GitHub account and if you like, just to sign out of your account. Cancel will bring you back into Script Lab (I probably would have titled the button “Close” instead of “Cancel”, not it gives you the impression that Cancel will disconnect the GitHub account from Script Lab, but it doesn’t). 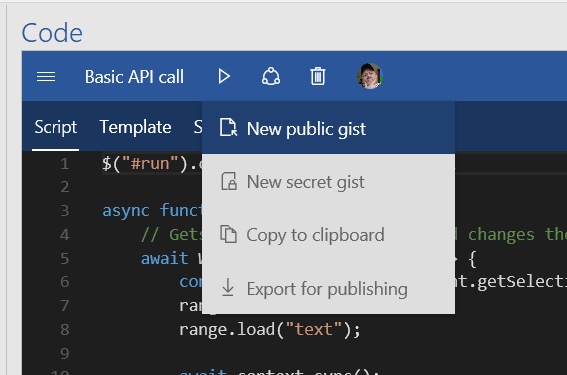 Using the option “New public gist” will push the content you created in Script Lab to GitHub. Make sure that before you do this the title property of the Script Lab project is what you want to call it. This will be adopted by GitHub as you’ll see a bit further down in this blogpost. The confirmation looks like this and will provide you the URL of the Gist that you just created. With this URL you can import the Gist at a later time. It created a new Gist, nicely formatted on GitHub and the menu changed into “Update existing gist”. 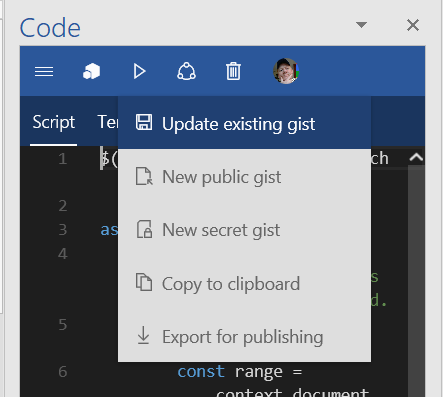 If you edit your code, push the “Update existing gist” option Script Lab will go out to GitHub again and save the changes. This is how it looks like on GitHub. Going into the revisions tab you can see that the line where I changed the color was updated. The line with color red was removed and replaced by the line with the color blue in it. How to restore your gist? 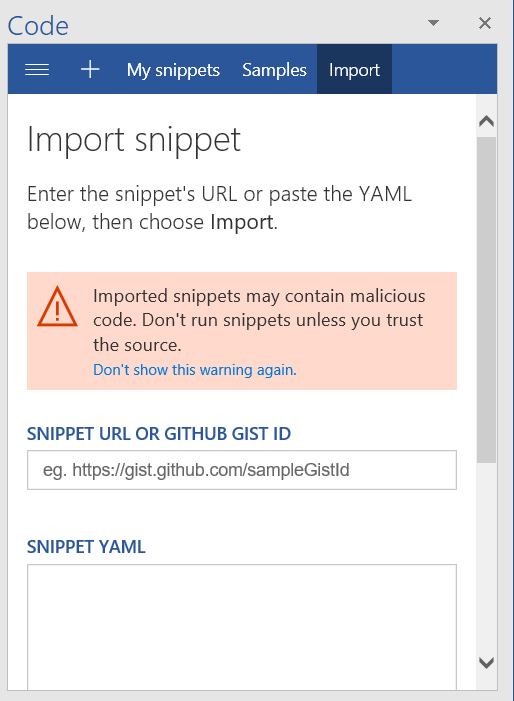 Enter the URL and import the snippet. 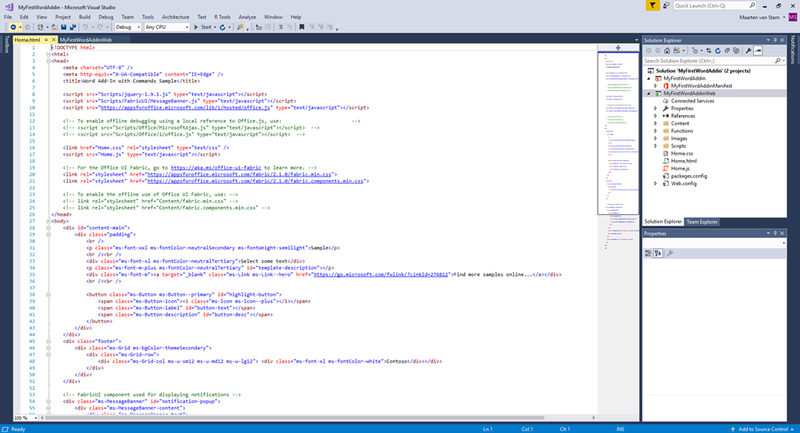 Now your Script Lab is filled with the code from the Gist, ready for you to continue your coding. 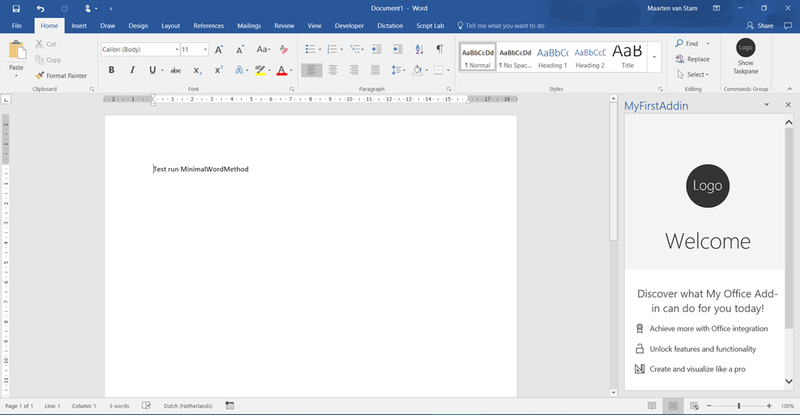 Up to now we researched creating and deploying a simple Office Add-in in Word Online and Word on your local machine. We still need to see how this Add-in can be deployed to a so called production environment, maybe even with a dev and staging level. 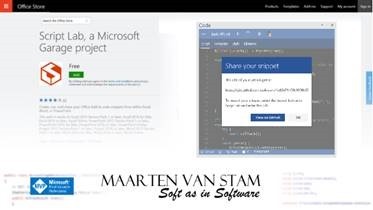 When you are done coding, tested it and added all the comments you now can share your snippets to GitHub right from the tool ready to share to your peer developers. With the Import function, you can do the same with code you got from shared snippets that you received from others. Excel 2013 Service Pack 1 or later, Excel 2016 for Mac, Excel 2016 or later, Excel Online, PowerPoint 2013 Service Pack 1 or later, PowerPoint 2016 for Mac, PowerPoint 2016 or later, PowerPoint Online, Project 2013 Service Pack 1 or later, Project 2016 or later, Word 2013 Service Pack 1 or later, Word 2016 for Mac, Word 2016 or later, Word Online. Remember that (we’ve discussed this a couple of blogposts earlier) each of the Office versions support their own subset of the APIs. 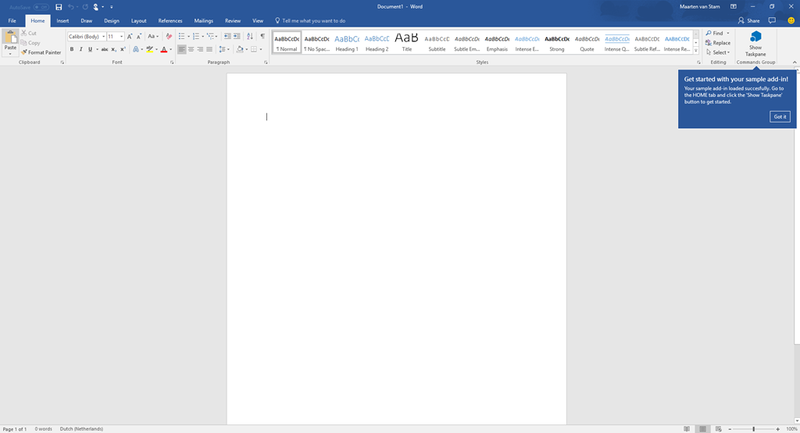 When using Office 2013 your options obviously are much more limited than when using Office 2016.